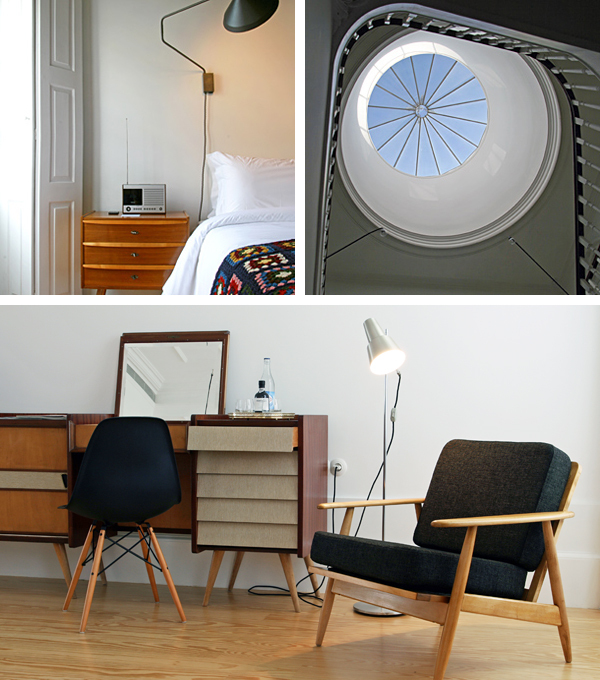 Whether classically elegant or super-sleek, our Portuguese hideaways are a rather stylish bunch. In her latest interiors focus, our resident design addict Abi picks out some of the most eye-catching examples – and shares some tips for recreating your favourite look at home. Many of our Portuguese hotels look to the country’s rich past for inspiration, with impeccably restored original features taking centre stage. If you like the sound of period charm, you’ll love Lisbon’s Palacio Ramalhete, an 18th-century mansion wrapped around a leafy courtyard. Its 12 rooms and suites have been skilfully woven into the structure of the old building: one is clad in smart oak panelling, others in ornate azulejos, and the Dove Room sits in the old chapel with a frescoed wall behind the shower. There’s even a suite in the former kitchen, with sofas tucked under a huge hearth. 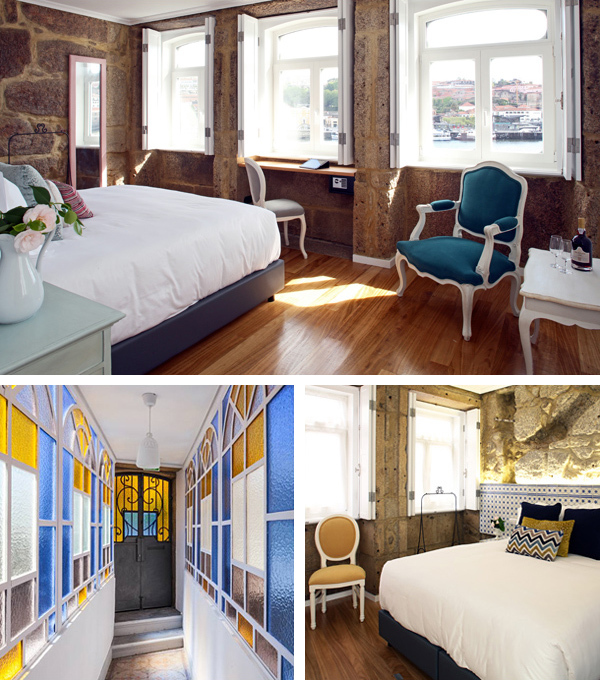 Over in Porto, salmon-pink waterfront B&B 1872 River House also brims with historic beauty. There are tiled panels, exposed-stone walls and beds under imposing mantels, along with black and white tiled bathrooms and a sprinkling of antiques. Perhaps most striking is the Art Nouveau walkway leading from the quayside, whose stained-glass windows cast colourful reflections all around. Idea to steal: Think about how to transform period elements into striking yet usable features. Could you create a window seat in a Victorian bay, or fit storage shelves in a disused fireplace? 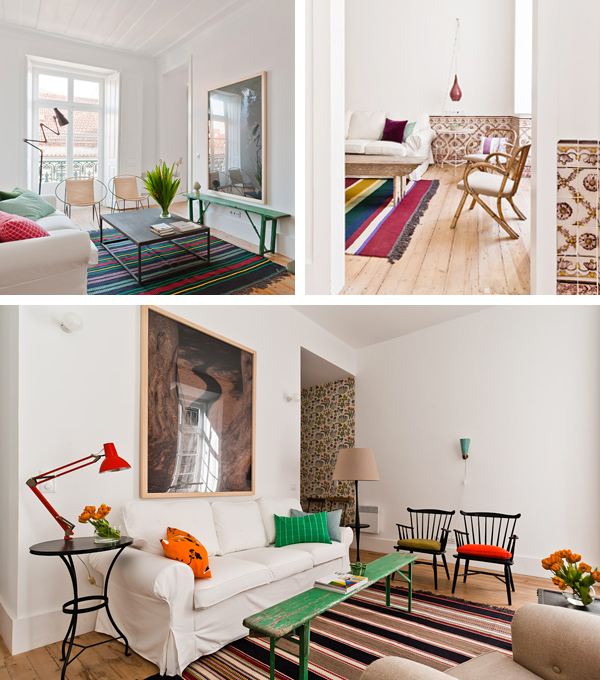 Other Portuguese properties blend the old with the new, incorporating quirky retro elements into their design. 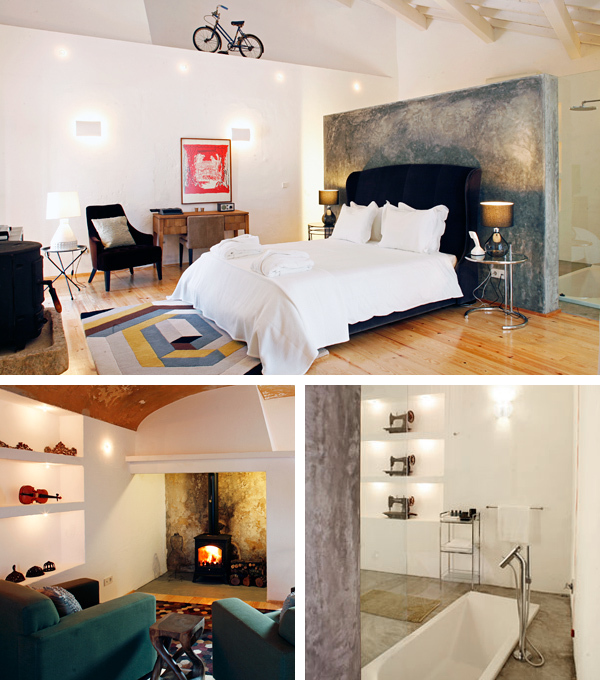 One such hotel is Rosa Et Al Townhouse, tucked behind an unassuming doorway in the hippest corner of Porto. It’s been imaginatively refurbished by brother-and-sister team Emanuel and Patricia and centres around a magnificent glass-domed staircase lined with modern art. The 6 rooms mix contemporary lighting and colourful handmade throws with mid-century pieces by the likes of Charles and Ray Eames, Jean Prouvé and Hans Wegner. Another example is Imani Country House, set amid orange groves just outside the Unesco-listed city of Evora. Born from the ruins of a sprawling farm, it pairs soaring rafters with chrome-and-glass tables, smooth oak floors and swathes of polished concrete. Dotted throughout are eclectic flea-market finds – a display of antique sewing machines in a bathroom, a collection of restored violins in a lounge, an old bicycle above a bed. Vintage treasures also feature strongly at Baixa House in downtown Lisbon. Its 13 light-filled apartments have reclaimed furniture, colourful rugs and salvaged tiles alongside marble bathrooms and sleek white kitchens – a very stylish combination. Idea to steal: Consider unusual ways to showcase your favourite items. You can suspend things from ceilings, nail things to walls, or group collections in hanging display boxes – the possibilities are endless! If no-holds-barred contemporary cool is more your style then take a look at Boutique Apartments Porto, designed by renowned architectural firm José Carlos Cruz. The open-plan spaces are cleverly zoned, with raised dining areas and boxed-in beds, and their pristine white walls provide the perfect backdrop for iconic pieces such as Eero Saarinen’s ‘Tulip’ table. 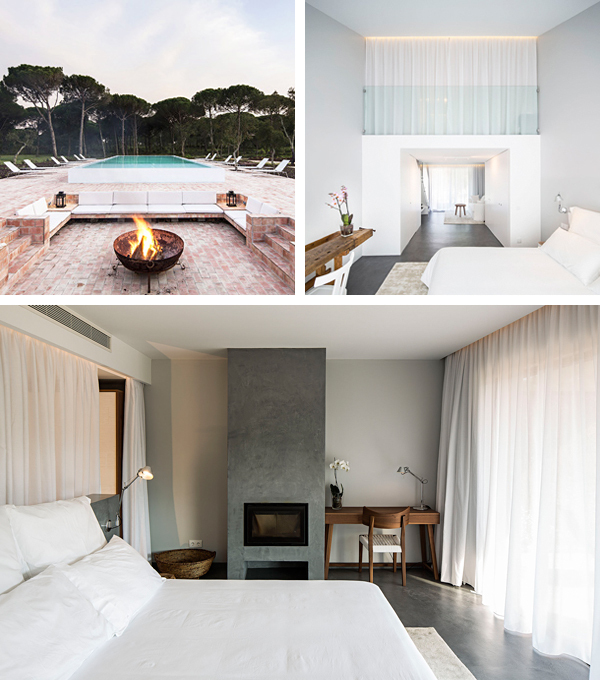 For minimalism in a more rural setting, head an hour south of Lisbon to Sublime Comporta, hidden in fragrant pine forest just a few miles from a sweeping beach. Its 14 rooms, restaurant and spa are swish all-white spaces with concrete floors, crisp Italian linens and frosted glass, pepped up with gnarled wooden tables and bright orchids. 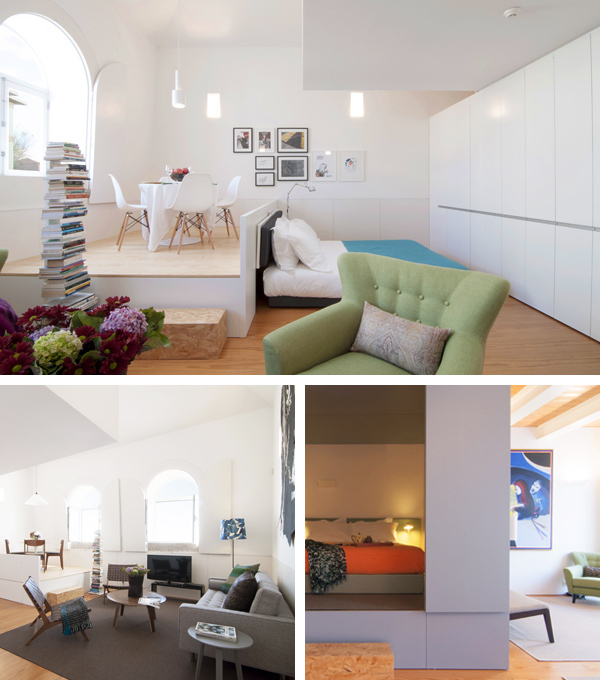 Idea to steal: Break up open-plan spaces by creating defined areas with specific uses. For example, cluster sofas around a rug, or use low shelving units as dividers. 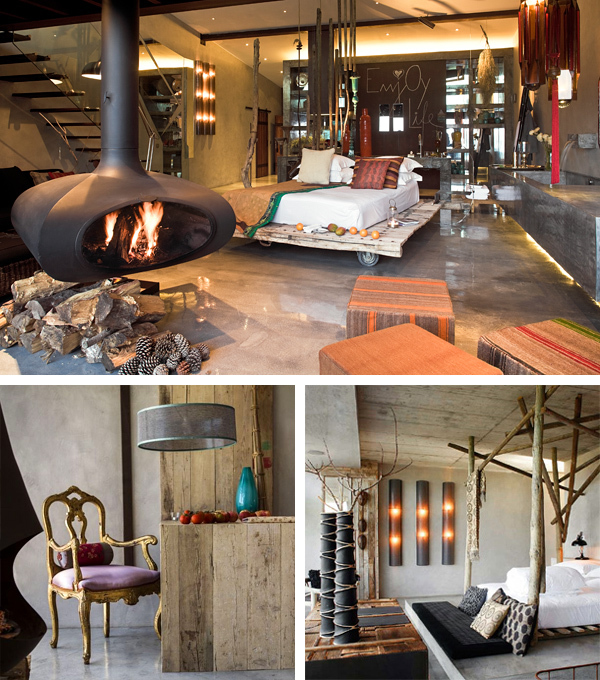 For unique style book into coastal eco-retreat Areias do Seixo, whose interiors blend Indian and Moroccan influences with clean, contemporary lines. There are driftwood beds set on rollers, gilded chairs and cabinets, colourful silks, burnished silver lanterns, and woodburners suspended from ceilings. Outside, decked pathways lead to a glowing fire circle backed by Atlantic dunes. It’s an inventive design playground, and almost every corner will take your breath away. Idea to steal: Let your imagination run wild, and combine different looks to form something totally individual. If you want to pair tribal African prints with French antiques, then go for it! 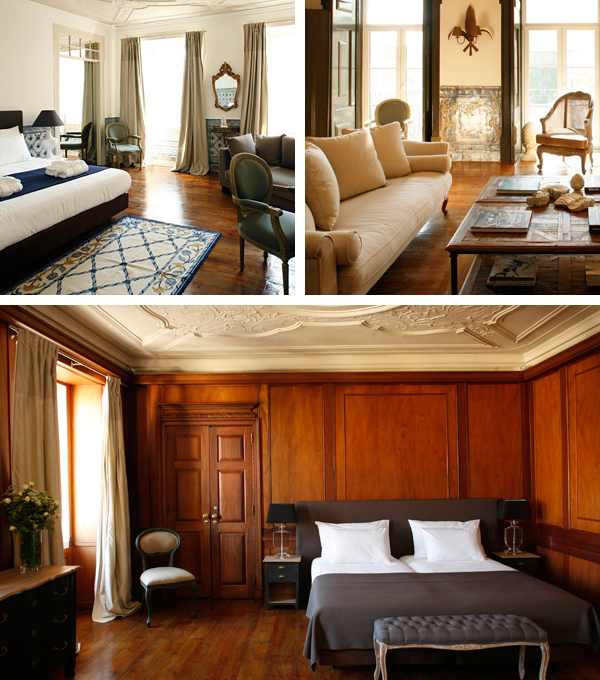 View our full collection of beautiful boutique hotels in Portugal.